Tour of Mont Collon, Arolla. 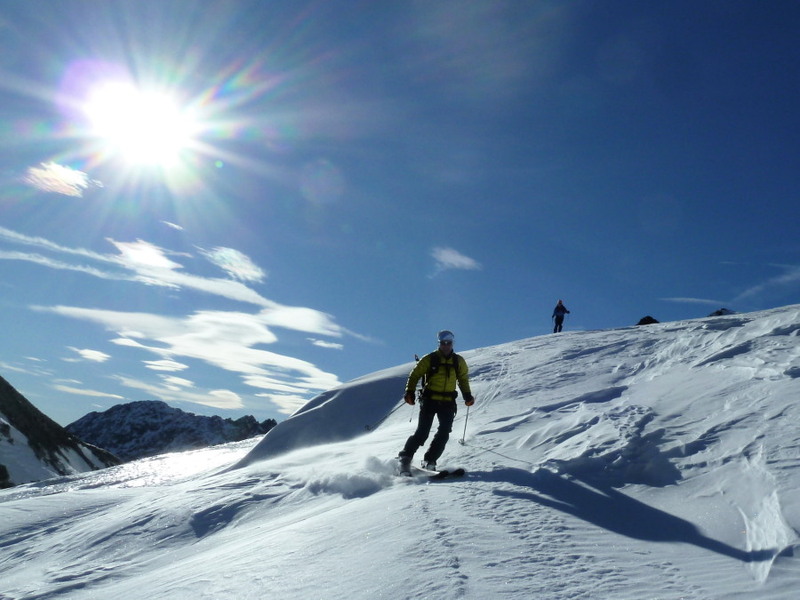 Guided ski tour. Tour of Mont Collon today. This is a longish day through some stunning scenery with great views. There's no tricky skiing so hopefully we'd be ok even if the snow wasn't good, and the glacier should be ok even with the current thin cover. 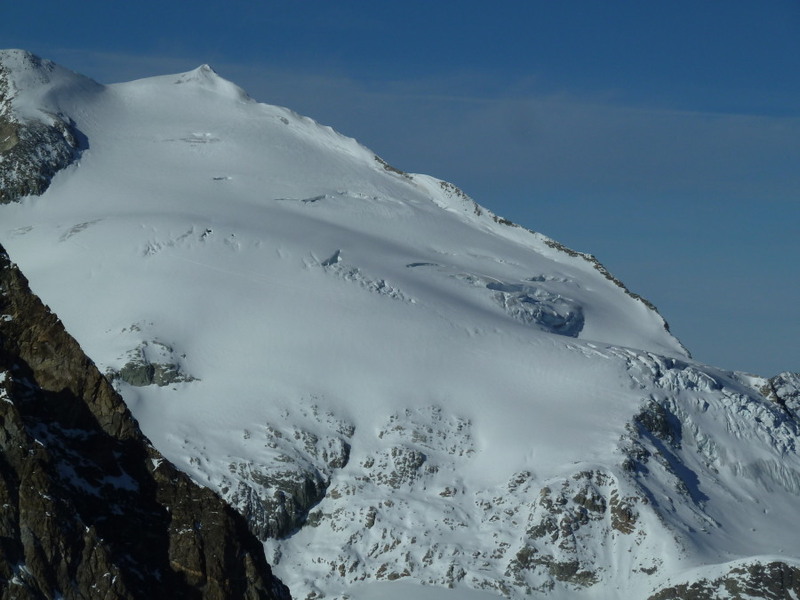 Early season is often a worry on glaciers if you've seen the same spots in late autumn, but this year there's so little snow that it doesn't look that different! 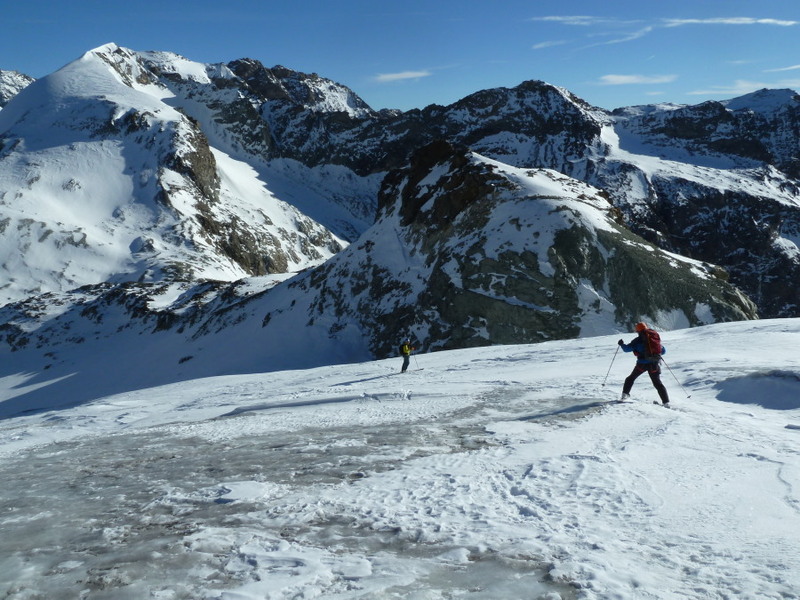 Skinning out of Arolla to the Vignettes hut is awkward at first (no snow!) 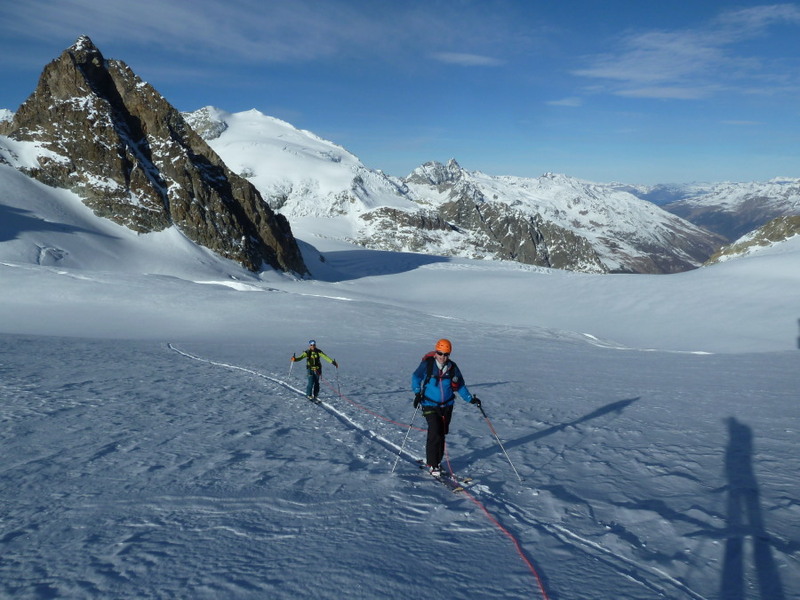 but you can get up the winter line (normal ski way) and the glacier is fine on the left going up. There are some big crevasses in the middle, so sticking left is a good idea. Surprisingly, the little descent to the Col de Chermontane is well filled-in with almost spring snow, and passes easily. We used a rope on the way to Col de l'Éveque, and I was glad we had. There are a few huge, open holes on the slope up to the col. No track either, although a few people have been up the Pigne. Looking back, the Pigne is (unsurprisingly) very open, and the existing track takes a fairly odd line! 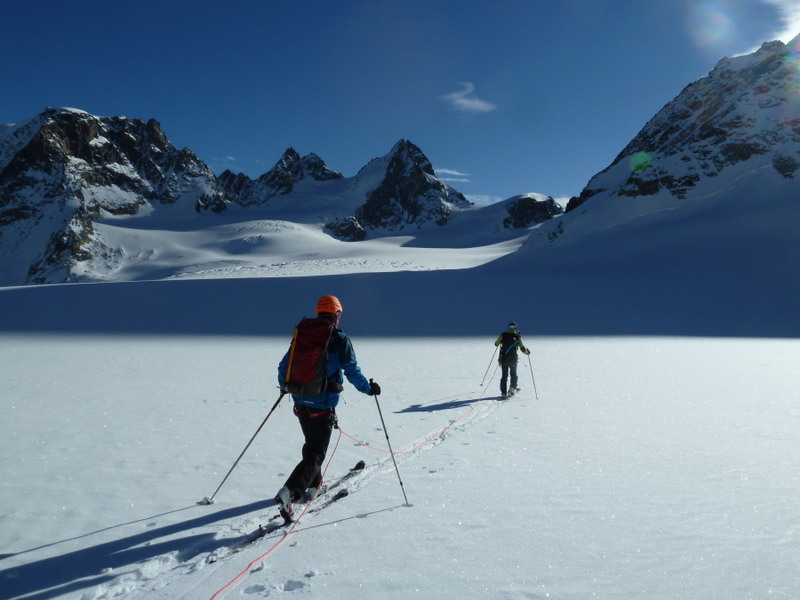 Descending towards the upper Arolla glacier is quite tricky, and needs some careful skiing around bare ice with some big crevasses! After that there's some nice open skiing on good snow. Phew. 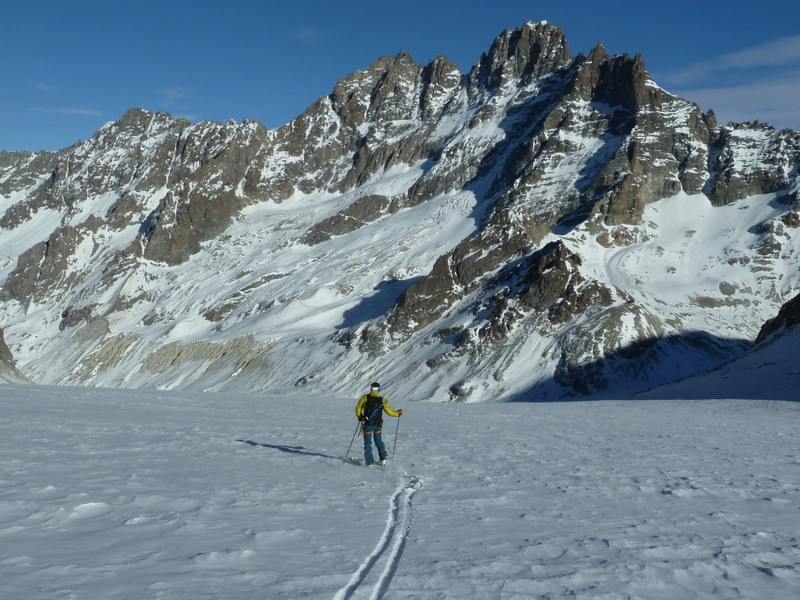 The snow lasts all the way along the flat to the hydro plant, but from there down the lower glacier glacier is a battle, very rocky, ski on/off...and a relief to hit the track down to Arolla!